Brazos County vital records are available from the Brazos County Clerk's Office. The county clerk files and records birth and death certificates, issues marriage licenses, and accounts for all funds paid to the office by way of fines and fees. 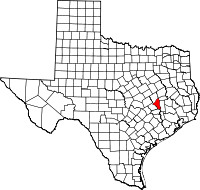 The office serves the cities/towns of Aggieland, Benchley, Bryan, College Station, Edge, Kurten, Law, Millican, Navasota, Reliance, Steep Hollow, Tabor, and Wellborn. Vital records are available to qualified individuals and with proper identification for a fee. Certified copies of birth certificates cost $23.00; certified copies of death certificates and marriage licenses cost $21.00. Payment is accepted in cash (in person) and money order or cashier's check (by mail).